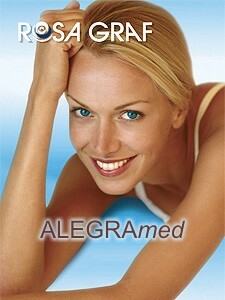 ALEGRAmed has been created for dry and very dry skin. It reconstructs the skin's natural balance through use of biotechnological effective ingredients. Especially dry and very dry skin show disturbed skin protection. The cause: Dry skin is marked by uneven appearance, scaliness, itching, and at times even enlarged pores. Reasons are the lack of lipids and natural moisturizing factor. The result is a disturbed barrier function, which leads to a reduction of moisture retaining capability and dry skin. ALEGRAmed helps the skin rebuild its own protection barrier. ALEGRAmed does not contain animal derived ingredients and no mineral oils. ALEGRAmed improves the moisture retaining ability of the top skin layers and the overall appearance of dry skin through regular use. ALEGRAmed makes skin smooth and supple.